Michael Thomas #13 of the New Orleans Saints makes the catch under pressure from Josh Hawkins #48 of the Philadelphia Eagles. Drew Brees threw two touchdown passes and the New Orleans Saints beat defending champion Philadelphia 20-14 Sunday, joining the history-making New England Patriots in the NFL playoff semi-finals. Two days before his 40th birthday, Brees overcame a first-pass pickoff to complete 28 of 38 throws for 301 yards and rally the host Saints from a 14-0 deficit in the team's greatest playoff fightback. "We just had to find our rhythm," Brees said. "I tried to take a shot on the first play and that didn't work. They got off to a phenomenal start." But the Saints will go marching into next Sunday's National Conference final against the visiting Los Angeles Rams for a berth in Super Bowl 53 on February 3 at Atlanta. The Rams and Saints each went an NFL-best 13-3 this season, with New Orleans beating the Rams 45-35 in November. The Saints won their only Super Bowl in 2010. The Rams own three NFL titles from three different cities -- Cleveland in 1945, Los Angeles in 1951 and the 2000 Super Bowl while based in St. Louis. They moved back to LA in 2016. 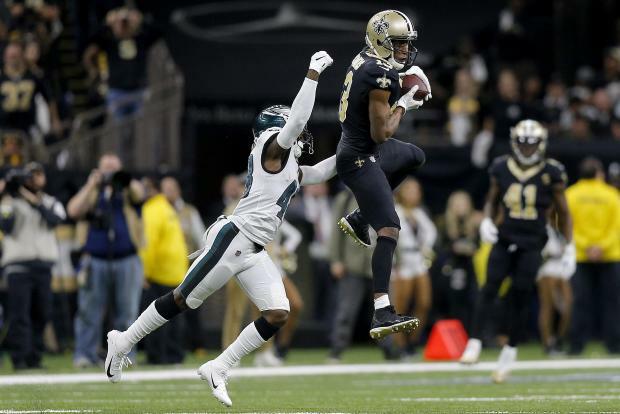 The Saints blasted Philadelphia 48-7 in a November meeting, but the Eagles served notice early they wouldn't suffer another disaster. Philadelphia's Cre'Von LeBlanc intercepted Brees's first pass to set up a 37-yard Nick Foles touchdown toss to Jordan Matthews. Foles followed with a 1-yard touchdown run later in the first quarter for a 14-0 Eagles lead. New Orleans answered with a 12-play, 79-yard touchdown drive -- sustained by a Taysom Hill fake punt run and capped by a 2-yard Brees touchdown pass to rookie Keith Kirkwood on fourth down -- and Will Lutz's 45-yard field goal made it 14-10 at half-time. The Saints took their first lead on a season-longest 18-play, 92-yard touchdown march that took 11:29 of the third quarter and ended with a 2-yard Brees touchdown pass to Michael Thomas. Lutz added a 39-yard field goal for a 20-14 New Orleans lead but missed from 52 yards with 2:58 remaining. Foles drove the Eagles into Saints territory but a pass deflected off the hands of Alshon Jeffery and into those of Saints defender Marshon Lattimore for an interception and New Orleans ran out the clock.